The average GPS satnav is a boring rectangular affair that will stick out like a sore thumb if you tried to mount one to a scooter. 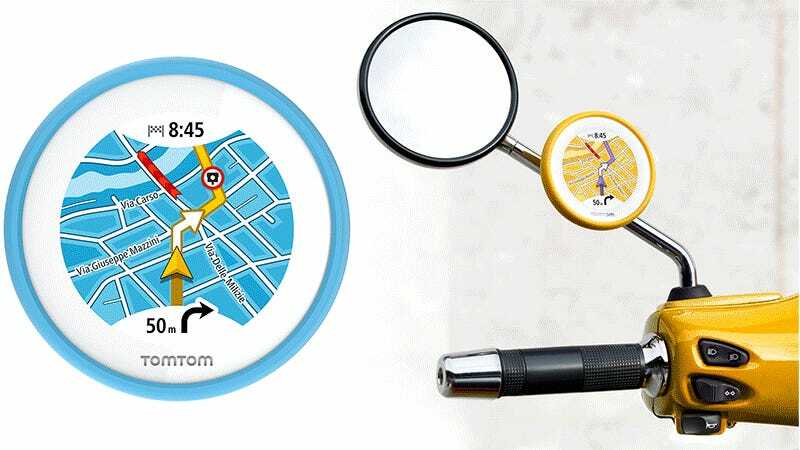 But just because you drive a curvaceous classic Vespa doesn’t mean you won’t ever get lost, so TomTom has created an adorable circular satnav designed to complement your scooter. However, the compact VIO doesn’t work as a standalone GPS navigator. It instead relies on a smartphone for its brain, wirelessly connecting to the TomTom mobile app and serving as more of an auxiliary touchscreen display. But while it lacks its own processor and other standalone electronics, it does contain additional GPS hardware of for improved location tracking. It’s also waterproof, comes with a bunch of colored housings to help it match your scooter, and can even be operated with gloves while you’re riding. In addition to providing turn-by-turn directions and visual warnings if you’re speeding, the VIO also displays information about incoming calls allowing a rider wearing a connected Bluetooth headset to answer or ignore them. At around $200 it isn’t cheap given its limited functionality without a smartphone nearby, but it’s so cute few Vespa riders would care.